...especially when you can't stop topping the ball. Bonus: Download a free, step-by-step checklist which will you teach how to stop topping the golf ball forever. It’s a perfect checklist to bring with you during your next golf game! 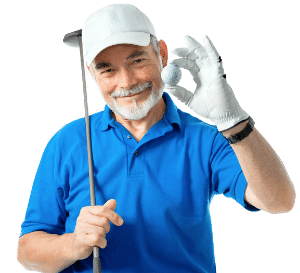 The famous golfer Jack Nicklaus believes that there is a problem that causes golfers of all handicap levels varying degrees of angst. If, as Jack suggests, it is a problem that plagues golfers of all skill levels, why does it seem that very few people are willing to address the issue and help us fix the problem. ...I have an idea about that. It’s just like when you go to a family reunion and your strange Uncle Herman latches on to you. You think to yourself that if you just ignore him, he will go away. I know I can't stop topping the ball…but maybe if I ignore the problem, it will just miraculously go away? Now, let’s talk about how to stop topping the ball. 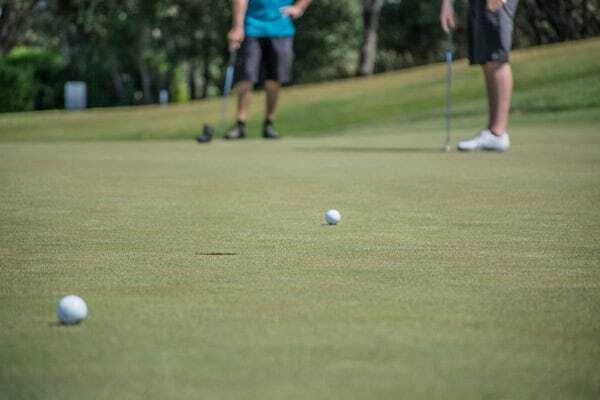 Your golf swing is nothing more than a circle starting at the bottom (6 o’clock), travelling upwards to the top, and then reversing back to the bottom and all the way to your follow through. All you need to do is get the ball in the way of this swinging circle. Then…you can't stop topping the ball. What happened? In simple terms, the ball was not in a position on the arc of this circle that allowed you to hit it squarely. The ball may have been too far forward, and when your club came through the impact zone, it was on its way up and never got a chance to hit the middle of the club face. It hit the ball on the bottom half, or even worse, the bottom edge of the club. It is even more pronounced with your irons, as they are meant to be contacted on your downswing, not on the upswing. Moving the ball back in your stance is the result of understanding the proper ball position and adjusting ball position to affect ball flight. Easy fix : Move the ball back in your stance. It is rare to see a professional top his driver nowadays, due to the larger club head. However, it is still an issue with long irons and fairway woods. I believe it comes from having an angle of attack that is too steep, causing the contact zone to shrink dramatically. With this shrunken hitting zone, it is difficult to ﻿get the sweet spot onto the golf ball. You need to flatten out the impact area on your swing arc, and then make sure that the ball lies somewhere in the middle of that zone. 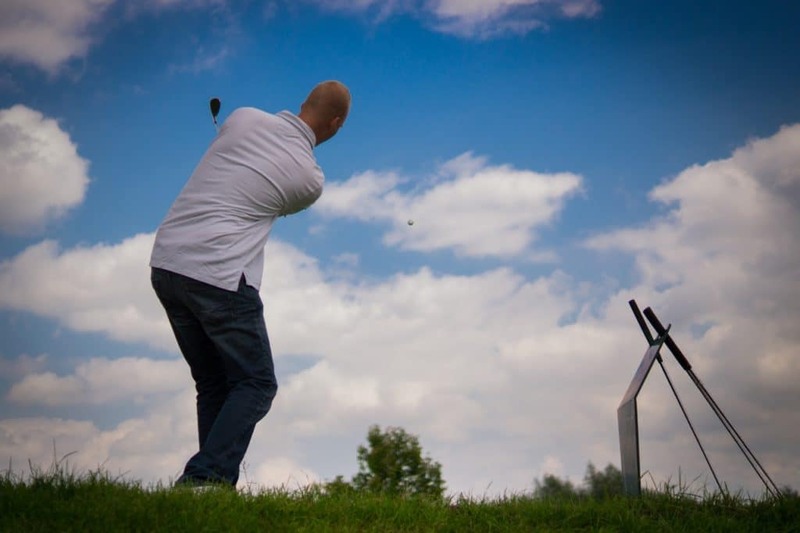 Keep in mind that with your shorter irons, you must hit the ball on the downswing, whereas, with your fairway woods and long irons, it is more of a sweeping motion. Medium fix: Move ever so slightly from a steep swing to one that is not so steep to help you to deliver your club on the right arc into the ball. This is a problem that players of nearly every sport will have happen now and then. Our adrenaline gets pumping and the next thing we know, we have overdone things. The truth is, controlling your adrenaline is a difficult thing to do. We want the feeling of anticipation that comes with the opportunity to succeed, and adrenaline helps us to perform in this way. But it can also hinder us by tricking us to try to overpower our way to success. How can we control this adrenaline rush? There is no drill, no tip that I can give to help. It all takes place mentally, in the head. Professional golfers on all Tours employ sports psychologists to help them with this. If you have seen the movie “Tin Cup”, you know what I mean. ...but he got the girl. As far as your game is concerned, try not to have too many peaks and valleys when it comes to your emotions. I know this is difficult. We love to fist pump. We love to celebrate. 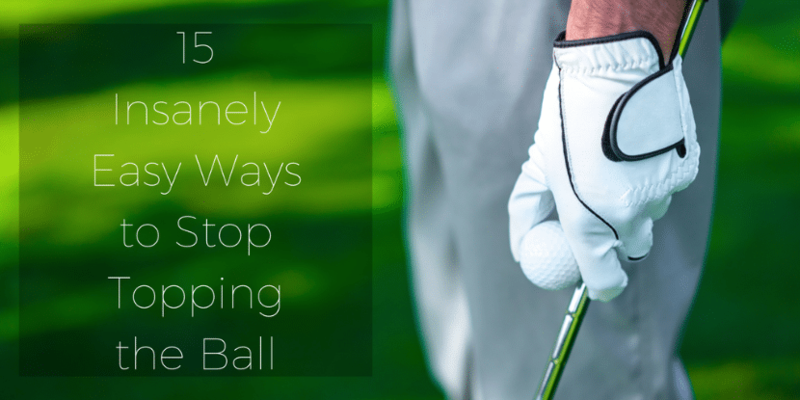 Easy fix: the trick is to keep your emotions in check…and, don’t hit the ball too hard. 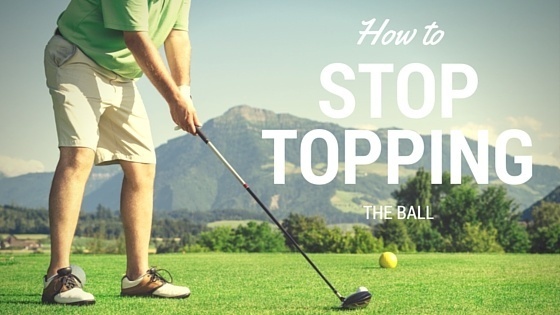 This will help you to stop topping the ball. This is one thing that has plagued me since I was a teen, not only when I play golf, but many other sports as well. It all stems from being too focused on the result and not the process. If I am playing with someone else who suffers from this, I try to assure them that I will watch the ball for them to tell them where it ends up. Easy advice to give, but not so easy to take. As GolfStateOfMinde.com states, the problem with this mistake is that it happens in a millisecond, resulting in perhaps a topped shot, but worse, a complete whiff. A little mind trick I use to help me keep my eyes on the ball is to train my eyes to stare at the ball intently. So much so that I am still focused on the spot where the ball was even after I have hit it: this technique has helped me to stop topping the ball considerably. I have been doing this so long now that I actually get an after-image of the ball for a split second even though it is not there anymore. Easy fix: stare at the ball intently so that you can stop topping the ball. Bonus: Download a free, step-by-step checklist which will you teach how to stop topping the golf ball forever. It's a perfect checklist to bring with you during your next golf game! All athletes have to learn about posture. Knees flexed (not bent), bend at the waist (back straight), arms hanging loose. It’s not rocket science, but it is a necessity to starting your golf swing. In the case of topping the ball, if you have incorrect posture in any of these areas, it could be what is at the root of the problem. There is only one way to develop proper posture. Work on a check list when you set up to the golf ball. It is all about training your body through repetition. Do it once and it might work. Do it over and over again and it becomes second nature. Medium fix: make sure you maintain correct posture throughout your swing. As your shoulders start your downswing, try to keep the left one down throughout impact. Let your right shoulder almost pivot under your chin on the follow through. Make sure the right shoulder stays below the level of the left all the way through impact and then stretch to follow through. Improper weight transfer is the basis for a lot of swing issues. When it comes to topping the ball, here is what, and why it happens. In a proper weight transfer, you start out at address neutral, that is, with your weight distributed evenly on each foot. As you start your backswing, your weight gradually shifts to your back foot. At the top of your backswing, your weight should be almost all on your back foot. As you transition to your downswing, your weight eases to your front foot. At follow through, your weight should be almost all on your front foot. The most common weight transfer mistake is called a “reverse pivot”. The best way to describe this is: when your weight is supposed to be on your back foot, it is on your front, and when your weight is supposed to be on your front foot, it is on your back. The reason this causes you to top the ball is when you are transitioning from backswing to downswing, your weight is supposed to be coming from back to front, which, in turn, would have your body moving towards the ball. In actuality the opposite is happening. Your weight is transitioning from front to back, and your body is moving away from the ball instead of towards it. Medium fix: whatever you do, fix your poor weight shift. Set up to take a swing. When you get to the top of your backswing, with your club almost parallel to the ground, stop your swing and hold it there. Try to lift your front foot off of the ground. If you can’t, this means that your weight is still on your front foot. Continue this drill until you can get to the point where you can lift your front foot off the ground. Then, complete your swing and hold your follow through position. From there, try and lift your back foot off the ground. If you can’t, it means that you haven’t transferred your weight properly to your front foot. At first, do this drill without hitting a ball. After you get a feeling for what your weight transfer should feel like, do this drill while hitting shots. Make sure and do this drill with all of your clubs. If you happen to lose your spine angle at any time during your golf swing, catastrophic things can occur. The one we are talking about here of course is a topping of the golf ball. The problem with a spine angle breakdown is that it starts a progression of other problems. Do not hunch your back. If you bend at the waist, and maintain that spine angle, you control one of the planes that determine whether you contact the golf ball with the middle of the club face, or in the case of a cold top, the bottom edge of the club. Hard fix: maintain your spine angle. One thing I have discovered over the years is that golf can be enjoyed by almost anyone. A lot of golf professionals will forget one thing though when teaching their students. 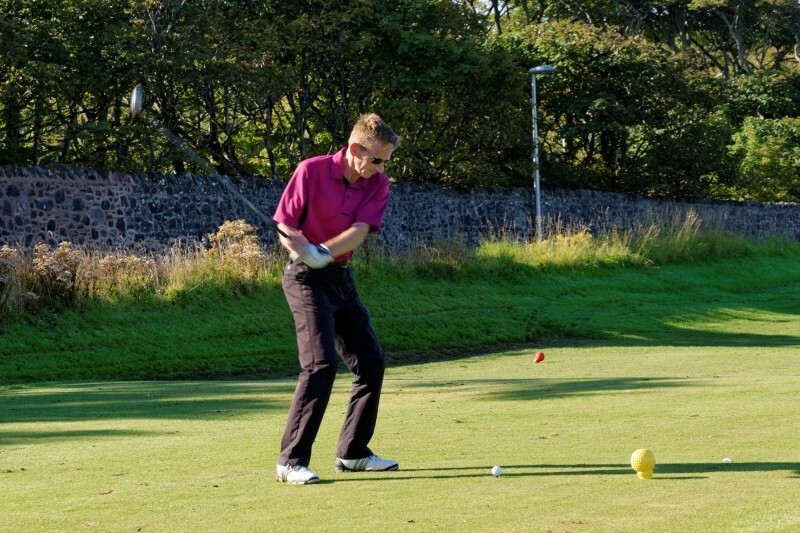 There are some aspects of a good golf swing that are physically unattainable by some people. Keeping a straight left arm is one of those things. That doesn’t diminish the importance of this, but it does mean that “It is what it is”. Stretching will help gain the range of motion you need here, but just do the best you can. The physics of this movement is this. When your left arm is no longer straight, you have to be careful how much further you want to take the club back. Too far and it collapses the left elbow and takes the spring out of the swing. Medium fix: straighten your left arm for as long as you can. This isn’t so much of a drill as it is a suggestion to help find your limits. When taking the club towards the top of your backswing, when you feel your left arm start to bend, that is when you should start your downswing. My guess, especially with your driver, is that there won’t be much difference in distance between this abbreviated swing and a full swing. Hopefully, what you will find is that after swinging in this manner, you may end up being able to keep your left arm straight for longer. The other thing you can try is isometrics. Before you do this, consult a doctor or physical therapist. Isometrics are a bit tricky, but when used properly, can increase your range of motion. The mistake of driving your legs forward really is just a timing issue. 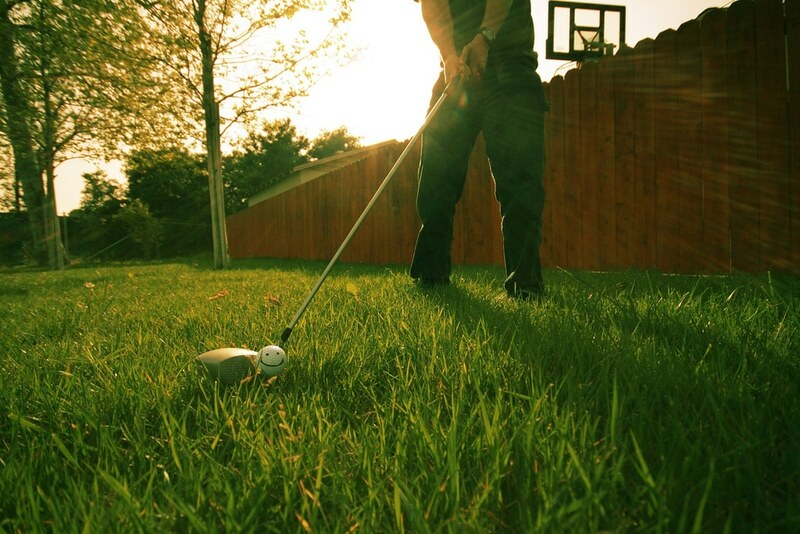 Can you imagine what kind of swing you would make if you didn’t drive your legs forward at all? I believe that the key to this is to coordinate your leg drive to happen when it is supposed to happen. If your leg drive takes place too early, your arms will lag way behind causing you to slide through the impact zone. At the same time, because of the sliding, there will probably be a recoil effect, shifting your weight back when it should be going forward. This, in turn, makes it next to impossible to hit the ball on the center of the club face. If you do happen to get lucky and do so, you will have no power behind your shot at all. There are other outcomes that could arise from this issue, however, a cold top is more than likely going to be the result. Medium fix: pay close attention to your timing and, don’t drive your legs forward too much. Golf can be a very lonely sport. We constantly want to get better, but our only measurement is the scorecard, which doesn’t always tell us the truth. A good score can sometimes be attributed to a hot putter, or a couple of lucky bounces. What we really need is meaningful feedback as to how our swing is progressing. If you’re lucky (and wealthy) you can have a golf professional on retainer to give you such feedback. A better option is to have a friend (someone you trust and don’t play for money with) watch you and provide input, not advice. There are some drills that can’t be done without an extra set of hands. Feedback like this is crucial to self evaluation. Easy fix: if at all possible, have a friend help you out with certain drills. All parts of your body have to work together; hands, wrists, arms, shoulders, feet and especially, your legs. This basic posture (knees flexed, not bent) is the key to starting your golf swing. Flex in your knees is where your power starts. If you stand straight legged and swing the club, the only weight transfer you will achieve is from swaying towards the ball. The spring effect that allows Ricky Fowler (who is 150 pounds soaking wet) to hit the ball 300 yards, comes from proper posture, starting with flexed knees. As important as it is to start with your knees flexed, it is equally important to maintain this flex throughout your swing. If you straighten your legs before impact, you will more than likely top the ball. Do you want to start your swing on the right track? Easy fix: Make sure you keep your knees flexed. 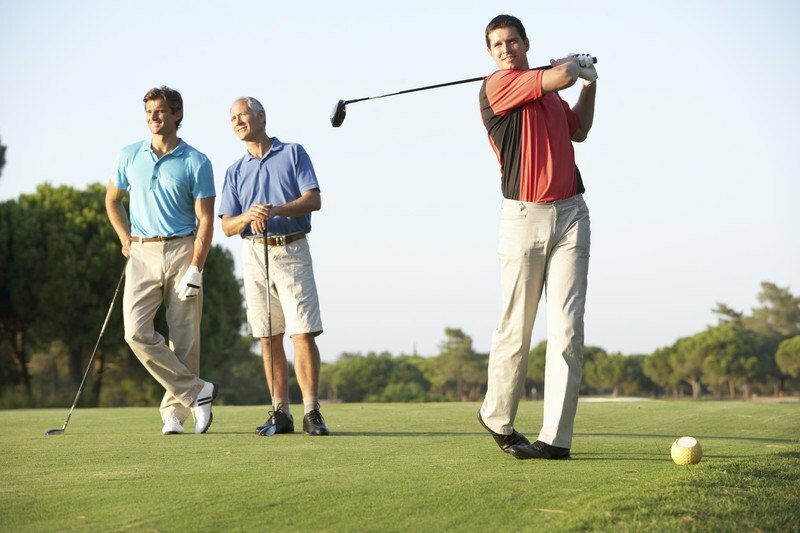 Most people would think that your swing should be initiated by your shoulders and arms, as they seem to be the muscles that would be responsible for getting your swing started. I think that is a bit of a misnomer. 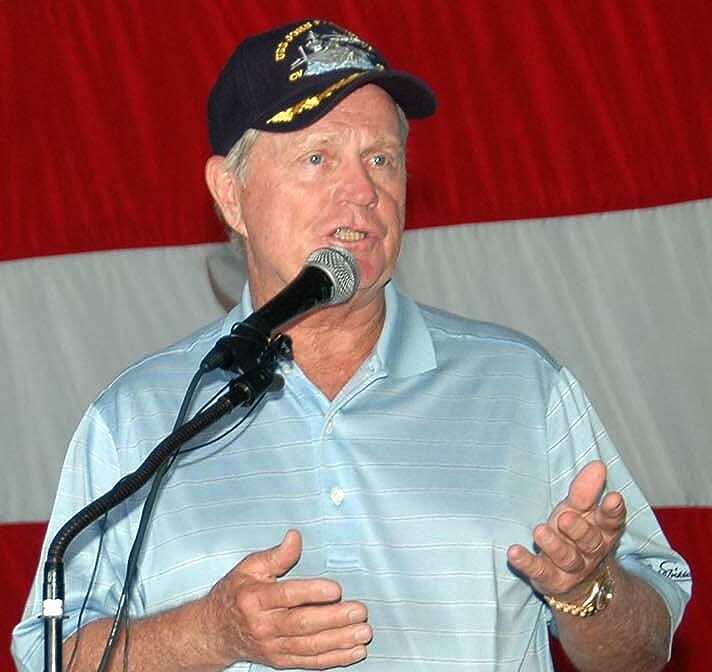 Jack Nicklaus was once quoted as saying, “the golf club should dominate you, instead of you dominating the club”. I think what he was trying to say was, let your downswing start in a natural flowing motion, and then the rest of your body, in sequence, will react to that natural motion. The danger with allowing your shoulders and arms to dictate the motion is that it is very easy to get anxious at this point of your swing. That anxiousness might make you get too quick, or forceful with your first motion towards the ball. Letting it start in a natural way, almost letting gravity take over for a split second, enables the shoulders, hands and hips to get collected before giving control to the feet and legs. Golfers are not thought of as having good footwork, but Nicklaus claimed that he never worked on his legs, just his feet. Hard fix: initiate your swing starting from the ground up. To me, your takeaway is the most important part of your golf swing. If you have a problem with your takeaway, it is virtually impossible to compensate elsewhere to rectify the problem and get back on track. There are some pros that teach people to “forward press” their wrists before taking the club away. I think that is just wrong. Take the club away low and slow, in one fluid motion, not doing anything about cocking your wrists until your club gets to parallel. Then, and only then, should you worry about getting your hands and wrists in the right position. The next part of this instruction is to keep your head steady. Note I am not saying to keep your head still. 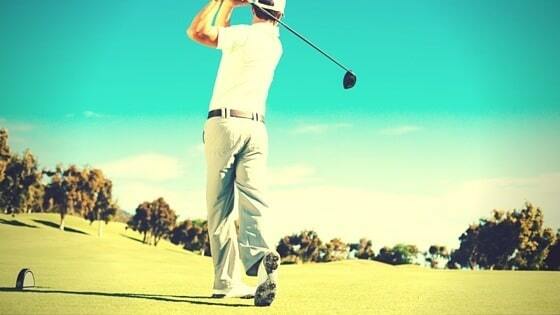 Watch any pro golfer and his or her head will move somewhat throughout the swing. You don’t want it jerking all over the place. Medium fix: be slow and steady with your backswing to help you swing everything back together and keep your head steady. For this drill, you will need a weighted club, preferably a driver. We are going to work on developing a low and slow takeaway. The extra weight should make it difficult to jerk the club away to start your backswing. Take the club away and hold it when it gets parallel to the ground. Repeat this until your forearms get tired. Do this at the start of every practice session. It will help you establish a smooth takeaway. I may have mentioned this before, but, it is incorrect that your head must remain still throughout your swing. Look at any professional golfer and you will see that they have some degree of head movement on the horizontal plane. What they don’t have is much, if any, movement on the vertical plane. If you have excessive head and shoulder movement in this area, you will suffer from, not only topping the ball, but chunking it as well. A trick to fix this is to imagine there is a smooth marble table top under your chin at address. Hard fix: you want to try to keep your chin touching this tabletop all the way through your swing. Obviously, your head can’t go down, but try to keep from lifting up as well. This drill should help you to keep your head and shoulders level throughout your swing. Have a friend stand opposite you, holding his/her driver upside down. When you get in your address position, he/she hovers the club grip just above your head. When you swing, try not to lift your head and contact the grip on your backswing. On your downswing, try to keep that head position. Do not hit balls during this drill, at least not at first. You don’t want to dead shank one off of your friend’s ankle. Afterwards, ask him/her exactly where your head was at impact. This is the one thing that most people assume is the problem when a topping of the ball has occurred. I am sure that you have played with someone who, after watching you top the ball, offers this timeless advice, “just keep your head down”. Thanks genius. You droop your shoulders, knowing that as right as he is, you still have to trudge that short distance to your ball and hit it again. Guess what? He isn’t completely right. The fact that you lifted your head is actually a result of other processes earlier in your swing that caused your head to come up. Topping the ball comes from a chain reaction. THEN the head must stay down. If you concentrate only on keeping your head down, you probably are still doomed to making a poor golf swing, due to other circumstances. Remember, the head lifting up is just the result of improper knee flex and not maintaining your spine angle. Easy fix: don’t lift up during the swing. I hope you never suffer the embarrassment of topping the golf ball. However, if you do, take to heart that you are not alone. It has happened to me, it has happened to Jack Nicklaus and will continue to happen to golfers of all levels. I hope you enjoyed the article. If you learned anything from this to help you, then I have succeeded in a small way, and I would ask you to comment as such. Please share this with your friends as well.